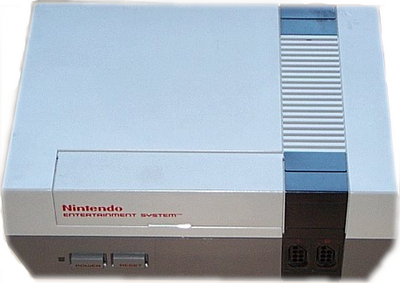 Nintendo8.com is an old school gamer's dream, it hosts emulations of some of the best early console games of my generation including the Sega Master System, the original 8-bit Nintendo, and even some Commodore 64 games. If you have never experienced these early games, I would suggest you take a look and appreciate the evolution of gaming. This will make you appreciate your now generation consoles! Here is a link to the top games played on the site. This is a good place to start your adventures! As an added bonus here is the link to the 8Bit Christmas music all you OG's (Old Gamers) have to have for Christmas. You can listen to the songs or download them and play them on your MP3 player. A special thanks goes to Dusty our WebMaster for showing me the game site. Thanks! Here is a fun little site that lets you build your own snowman. Unfortunately, there are not a lot of different choices you can make with the snowman and the ways they have for you to share your creation are extremely limited. To save your picture you will have to do a screen capture! 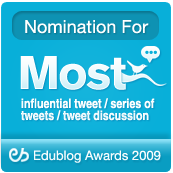 Here are my votes for this year's Edublog Awards. While I realize I am not influential enough to lead any of these suggestions to a victory, I hope my explanations for why I chose these will be appreciated. If you would like to vote for any or all of these, simply click on the badge and it will take you to the appropriate site. This blog is one of my favorite blogs to read. The reason I enjoy it so much is because the author, Brian Crosby, shares his successes and failures from his classroom. I love being able to look into his thoughts and see what he sees. 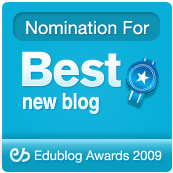 I chose this blog for the Best New Blog because of the amazing experimentation that is taking place here. Mr. Moore and Mrs. Vander Velde have incorporated back channeling throughout their curriculum. 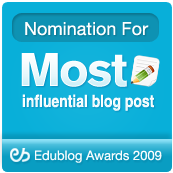 If I were still a regular ed teacher I would "borrow" their great ideas regularly. 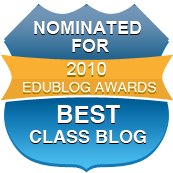 Yes, this blog has been nominated for this award, but I chose Mr. McClung's World as my choice for best class blog. He is consistently blogging about what his class is doing and is incorporating those posts in his daily work with his students. 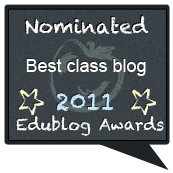 An amazing example of what class blogs should look like. Tiffany is a student at the Shanghai American School in China. Her blog posts are top notch. When many students would write as little as possible, Tiffany does much, much more. 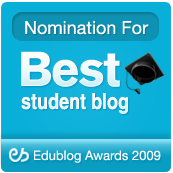 This student blog should be used as an example of what we should expect out of our students. Edchat allows me to vent about what is happening in education today. Here is the link to the spreadsheet with your answers. JibJab is a fun site where you can take pictures and insert them into movies. I have picked two movies you can use Elf Snowball Fight and ElfYourself. There are many JibJabs you can make, but most of them require you to purchase a membership. Here is the link to our eighth grade picture set on Flickr. You will have to download pictures and then upload them to create your movie. Just click on the the pictures you want to download. Right click on the picture and save as: name of person to your desktop. 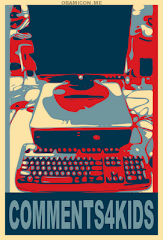 Then you will have them to upload. When you have created your JibJab, download the video and upload it to the video section of the 8th Grade Ning. Don't forget to log in first. There really is no way to explain the beauty and simplicity of this creative art site. I would suggest you go and check it out immediately. If this doesn't make you happy, you need to get a head check! Here is the link to Bomomo. 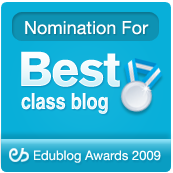 I found a link to this site and several others I will be sharing at East Dragon Den, which has been nominated for Best Class Blog in the Edublog awards. Here is what Justin does on his day off. I was as surprised as you! I want you to explore the site. Find three neat things you can share with the class. Create a graph using made up data and then save them to the desktop of your computer as a jpeg. Then upload the picture to the class Ning. Grammar Ninja is a grammar game where you identify parts of speech by throwing shurikens. There are three difficulty levels in the game. It tests your ability to find adjectives, adverbs, nouns, verbs, conjunctions, articles and more. This is a pretty fun way to drill yourself over the parts of speech!